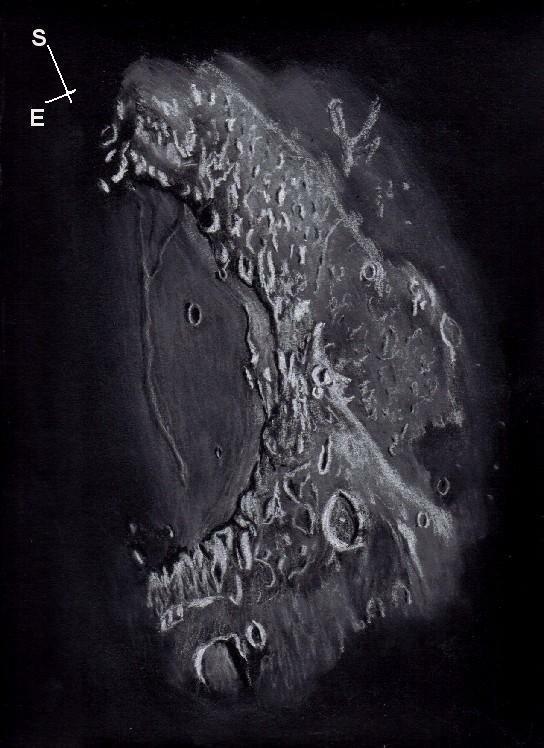 Mare Crisium is that interesting isolated sea on the northeastern side of the visible lunar surface. Only about half of it was visible during this sketching session. The Nectarian Period event that formed this feature occurred more than 3.8 billion years ago. The mare portion of the basin is about 500 kilometers across. In the grazing sunlight across the floor, wrinkled ridges were visible in the north to south direction. Also on the western floor craters Picard (24 km. ), Peirce (19 km.) and Swift (11km.) stood out in the low light. I could clearly see the lighter colored bench lava that partly buried craters here such as Yerkes (37 km.). Tall flat top mountains (massifs) beyond the shore stand at 2-5 kilometers above the sea. Also beyond the sea to the West crater Proclus (28 km.) with its remarkable bright rays was reflecting some sunlight. Your sketch looks fantastic, and the detail is excellent. great sketch Frank!I hope in good weather, next day to made new deep-sky sketches…. Thank you. Clear skies to you.